Some beach goers rate beaches by the texture of the sand, or the quality of the bathrooms or the price of admission. At Save the Sound, we care about water quality. 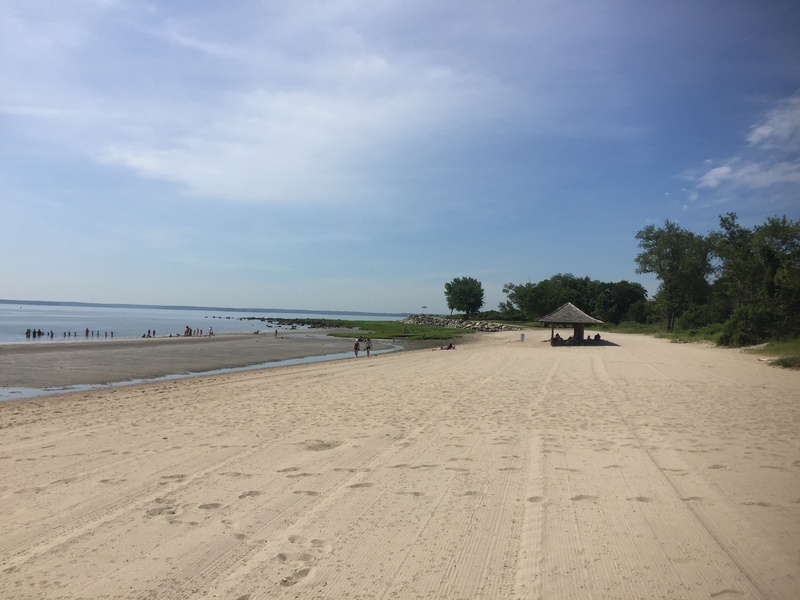 In an effort to recognize success, Save the Sound is highlighting 7 public Long Island Sound beaches with exceptional water quality. All 7 beaches below scored A in the online beach health map the SoundHealthExplorer.org. The Sound Health Explorer grades beaches on an “A” to “F” scale. The interactive map paints a picture of water quality trends using data from health departments in New York City, Westchester County, Connecticut, and Long Island. Each grade is based on how often over the last five years a beach has failed U.S. Environmental Protection Agency (EPA) bacterial pollution standards for safe swimming. [That standard is 104 units of Enterococcus/100 ml]. Dry summer seasons in 2014 and 2015 helped with improved beach water quality. Hammonasset Beach State Park has over 2 miles of shoreline making it an attractive destination for the entire region. As Connecticut’s largest shoreline park with over 1.9 million visits per year, it is the one of the most popular attractions in the state. The new nature center offers workshops and classes that please visitors of all ages. Over 500 campsites set a short distance to the shore, adds a unique twist. Parking fees apply. Greenwich Point Beach in CT is a nature lover’s paradise. It’s hard-to-find location translates into an unspoiled natural setting. Perseverance pays off for visitors with the chance to explore bucolic nature trails, two islands and a peninsula. Check parking restrictions and entrance fees before visiting. Glen Island Beach in New Rochelle, NY has a unique history. In 1890s it was considered an international theme park destination for steamship visitors. Westchester County residency required for admission, in addition to parking and beach access fees. Orchard Beach is sometimes called the ‘Bronx Riviera.’ At 1 mile long, with a crescent shape, NYC residents find it an attractive day trip for a city escape. Its man-made coastline was conceived by Robert Moses. Fees for parking and beach access apply. At Sunken Meadow State Park, everyone can find something to like. Along three miles of beach you can find a boardwalk, biking, canoeing, kayaking, paddle board rentals, horseback riding, tidal flats, salt marshes and large glacial bluffs. Hiking along six miles of nature trails adds to the appeal. Its picnic areas attract throngs of Long Island residents for grilling and numerous sports fields. Parking fees apply. For Ocean Beach Park visitors, the word nostalgia comes to mind. The old-fashioned mini-golf, arcade, carousel and boardwalk, make you feel as if you’ve stepped back in time. Dividing one’s time between the half mile pebbly beach and the olympic swimming pool with water slide, might prove a visitor’s biggest challenge. Parking fees apply. Centre Island Sound Beach is in Bayville, NY on the north shore of Long Island. At less than 1000 feet, it is somewhat short yet is still a popular destination for beach goers in Nassau County. Parking fees and residency requirements may apply. To see a complete, Sound-wide picture of beach health, visit SoundHealthExplorer.org. Secluded Greenwich Point Beach is very popular on weekends.